Setting off traps will now create a detection event allowing the trap to be "heard" by nearby NPCs. Thank you to DrMonops for his help with this mod. Forwarded one more change from the Unofficial Patch. Traps Are Dangerous: Reduced the damage done by dunCGTrapFireTriggerEnch01 [ENCH:0010E4AF]. This should make the opening scene much less deadly. Mining Makes Noise: Moved CreateDetectionEvent to end of function (rather than start). This should resolve the infinite mining loop issue. The CCOR versions were already set up this way and did not need to be updated. Forwarded some more script changes from USKP. Lowered the damage value on the gas explosion to prevent CTDs. Increased the detection event created by the bear traps (though they're still pretty quiet relative to many of the other traps). Updated patches where needed for continued compatibility with Follower Trap Safety and Complete Crafting Overhaul. Removed changes from Traps Are Dangerous that were causing CTD issues. Incorporated changes from USKP + UDGP v2.0. 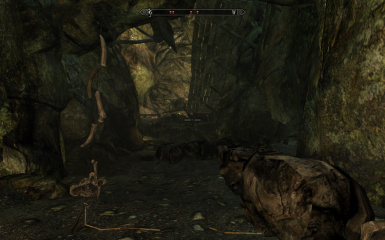 Added detection events to a couple of traps from Dawnguard that were missing them. Updated "Follower Trap Safety" patch with changes from USKP v2.0. Added a compatibility patch for Follower Trap Safety. Updated several scripts with changes from the recent USKP update. Added a new "Mining Makes Noise" option. Included a couple of script changes made by USKP that I had previously missed. Have you ever noticed how enemy NPCs never seem too concerned when a trap is triggered? Even when a dozen large boulders just came crashing down several feet from them, they have no reaction--no alarm that someone has triggered one of their traps, nothing. This instantly kills my immersion, even more so when playing a stealthy character. I've seen mods that increase the damage done by traps, but I've not been able to find a single one that addresses this issue... so here it is. In the vanilla game, traps are set up to create a very small detection event, but ONLY if you actually get hit by the trap. If you avoid taking damage, then that bandit standing 10 feet away will continue to act as if nothing has happened. And even if you do take damage the detection event created is so small as to not have much of any effect unless the enemy is within a few feet of you. This mod creates a detection event whenever a trap is triggered. Any nearby enemies will instantly become alerted and will start searching for you. 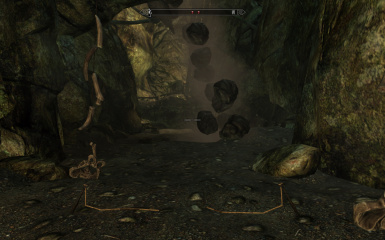 I have set different traps to create different degrees of detection events, so falling boulders or exploding traps will create quite a bit of noise and are likely to alert everyone in the area, while swinging maces and bear traps will only create a slight noise and will only alert enemies who are fairly close. Creates a detection event whenever a trap is triggered, alerting nearby enemies. Optional version increases the damage done by traps, making them more dangerous. Optional file also adds a detection event when mining ore veins. Traps are Dangerous: In addition to the added detection events, this version also includes increased damages for most traps in the game. This file requires both Dawnguard and Dragonborn. This file includes all of the changes from Traps Make Noise, so install it in place of the main file. Mining Makes Noise: This is an optional add-on file that adds a detection event to mining. This is just a simple script replacement and doesn't need an .esp file. There are compatible versions available for Complete Crafting Overhaul Remade and SkyRe (install only one version). I strongly recommend using Wiseman303s Trap Fixes. It makes some much needed improvements to traps and provides fully compatible options for Traps Make Noise and Traps Are Dangerous. After installing the appropriate options from Trap Fixes, download the updated script provided here under "Miscellaneous Files" and allow it to overwrite the MagicTrap script. This updated script will carry forward a recent fix from the Unofficial Patch. While it's not required, I also recommend using Traps Make Noise alongside a mod that increases the alert times for NPCs, such as Stealth Skills Rebalanced. If you don't want your followers stumbling into traps and ruining your stealthy approach, try Follower Trap Safety by Alek. You may also want to consider Better Stealth AI for Followers for further improving follower stealth behavior. - Traps Make Noise should work fine with mods that alter trap damage, leveling, or disease rates. Most of the "noise" changes are script edits. - Traps Make Noise (and are Dangerous) will conflict with other mods that alter trap damage, leveling, or disease rates. The "damage" changes are handled by edits to the plugin records, so you can check for mod conflicts using TESEdit. - Mining Makes Noise will conflict with any mod that changes the MineOreScript. There are compatible versions available for Complete Crafting Overhaul Remade and SkyRe (choose only one version). - All files are compatible with fixes from the Unofficial Patch (as of latest update). - If you are using Follower Trap Safety, download the compatibility patch provided here, and allow it to overwrite the TrapBear script. - If you are using Wiseman303's Trap Fixes then, after installing the appropriate options from that mod page, download the compatibility patch provided here, and allow it to overwrite the MagicTrap script. Check out what else I'm doing.